Rosy Outlook: My Current Beauty Favorites! Happy Friday loves! Hope y'all had a great week and have some fun weekend plans ahead. I'm very excited because we have a big company Gala on Saturday! I can't wait to get dressed up and have a night out with the hubby in DC. I'll definitely try to get pictures of my dress so I can share either on Instagram or here on the blog! It's cocktail attire so not super formal but my dress is so much fun! 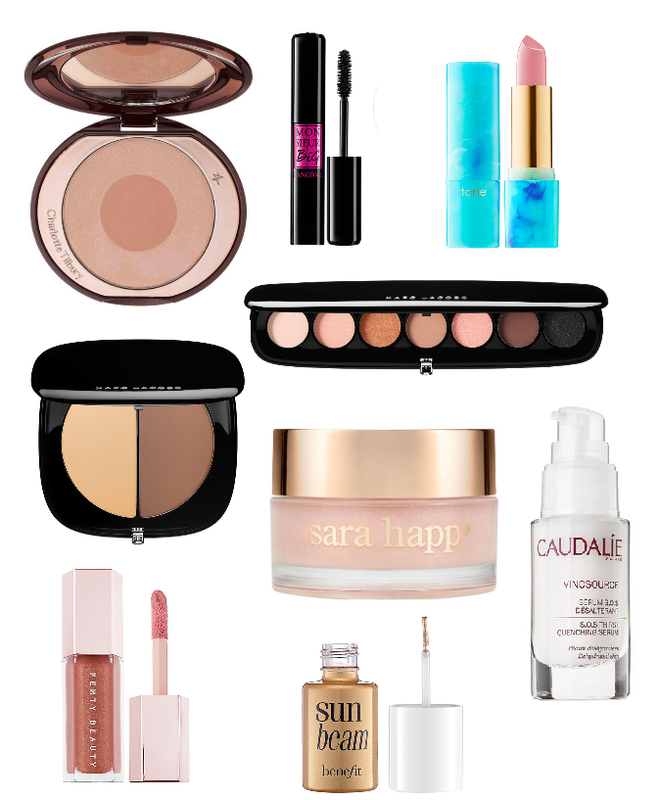 I have been trying a lot of new beauty products lately and found some that I absolutely ADORE. My favorite find is definitely this Lancome mascara! I'm a big mascara addict but this one has to be the best I've ever tried. With one swipe it makes your lashes look SO long and so voluminous. I also posted about the Sarah Happy Lip Slip on my Instagram the other day because I had just received it in the mail and I'm already so in love. My lips feel so moisturized which is so rare during the winter months! Also, if you're looking for the perfect every day eye palette, this one from Marc Jacobs is AMAZING. It's so pigmented and so feminine! Have fun at your gala this weekend! That sounds amazing! Ah!! How exciting! I definitely want to see your dress, I know you’ll gorgeous! I’ve been eyeing some of these products myself, so I’m glad that you’re loving them, which gives me more reason to finally try them out. That Tarte lipstick is one of them. I had a set in my cart at Sephora and of course it sold out :( I adore the packaging. Also, that mascara and the lip balm sound so good! Thanks for sharing, beauty, and have fun at the dinner! Lancome has been killing it in the mascara game recently! I need to try this one next! I also want to check out the lip scrub. Have so much fun this weekend! These products look good. I love the lipstick color. The gala sounds like fun! you are sure to be gorgeous. These beauty items look great. So many amazing products that I need to try! That highlight looks so pretty! These products sound really exciting! Have fun on your gala dear!